This salad is a four part (but easy) process. Preheat oven to 400 degrees F. Toss squash with the olive oil and toss to coat. Place on a baking sheet and sprinkle with salt. Bake until tender, about 20 minutes. You can roast the chickpeas at the same time the squash is roasting. Dry the chickpeas between paper towels, rubbing them a bit in paper towels. Toss the dried chickpeas with olive oil, syrup, cinnamon and salt. Transfer to a baking dish and roast for about 20 minutes. Remove and toss with more salt if needed. While the squash and chickpeas are roasting, make the vinaigrette. Place all ingredients in a blender and emulsified. Now you’re ready to assemble the salad. Divide and arrange Romaine on four plates. Evenly divide squash, chickpeas, pear slices, pomemgranate seeds and pecans. Drizzle with Dijon Vinaigrette. The original recipe also called for avocados. I left them out here because I thought they might deflect from the flavors of the squash, chickpeas, and pecans. Add them if you like. 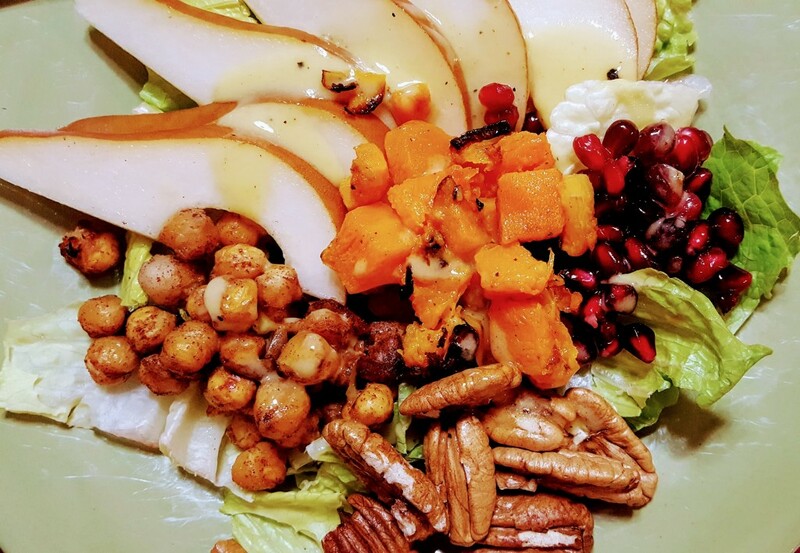 I am linking this salad up to Deb’s Souper (Soup, Salad & Sammies) Sundays at Kahakai Kitchen. Stay tuned for a Red Rice Salad (loaded with veggies) and a Sesame Noodle Salad (one for Cook the Books and one for Food ‘n Flix) before the month is completely over. You know that I love salads, don’t you? I really wonder why I can’t find butternut squash in winter…I am not kidding..they ain’t available in winter over here. That is weird. Butternut is considered a “winter” squash here. Beautiful salad, love everything about this!! Thanks, Cheri. It was pretty tasty. I love those roasted chickpeas! Do you eat these salads for dinner or lunch? I can do a hearty salad at lunch but dinner I seem to need something more substantial. Great recipe! I do happy dances, too. This is so good, Eliot. Love all of the ingredients that you have combine! Yum! Looks wonderful, I love the combination of unique ingredients! It is a good and tasty combo. Thanks, Chris. You’re welcome. Hopefully I will be sharing more as we mix in some salads with our rice bowls. This salad looks fabulous. I don’t like raw chick peas, but I adore them roasted! Such a lovely combination of ingredients!! I love ’em raw and roasted! This sounds just perfect! I love chickpeas, and that flavor combo is just perfect. 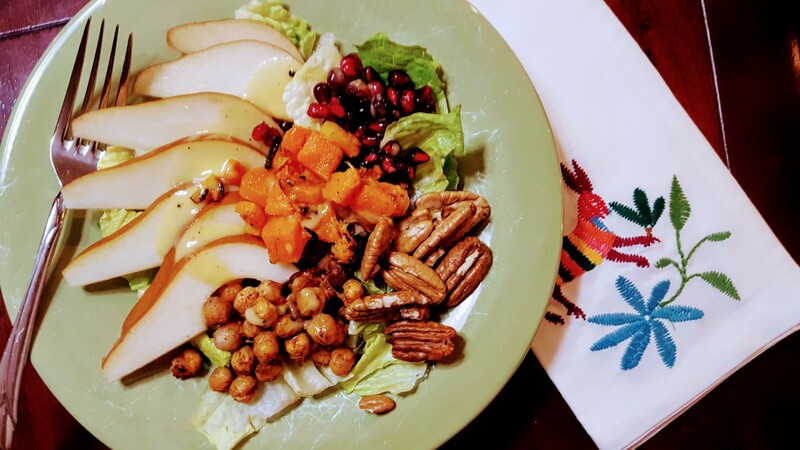 A lovely winter salad with a glitter of summer. Those roasted cinnamon maple chickpeas look fab! 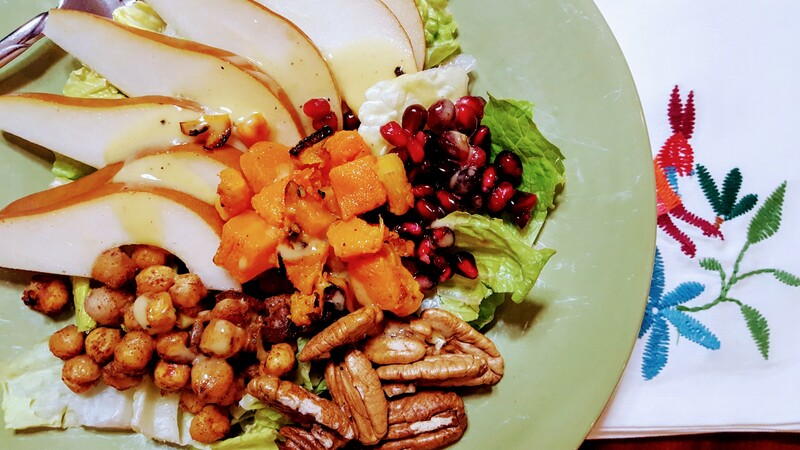 I love winter salads. Cinnamon is by far my favorite spice! Great salad! It’s so warming and winter-like! Now this is my kind of salad! Love all of the ingredients and what a beautiful outcome. Definitely a salad one would want to eat. And keep eating…. Thanks, M.J.
Wow that is one stunningly presented salad, i am loving all the flavours here – esp. the chickpeas! Thanks. Love chickpeas in anything.